The Pink Stamper set up a new website and couldnt get her old name so now it is "My Pink Stamper" she is having challenges and give aways all week to celebrate her 1,000,000 hit. Congrats Robyn! 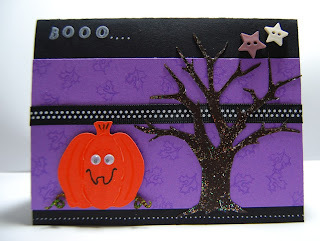 Yesterdays challenge was to use any real old tools to make a page or card....well I didnt have anything but her card was Halloween so it inspired me to make this! The tree and pumpkin are from Cricut Paper Doll dress up cartridge.